Sometimes I’ll make a recipe for the first time and it’ll be perfect. Other times I’ll make a recipe and I can’t stop myself from playing with it. Case in point: these chocolate cupcakes from Elana Amsterdam’s Gluten-Free Cupcakes. It began as a simple affair, with mixing wet and dry ingredients together. The cupcakes, as they stand in the original recipe, are already great. I just couldn’t resist putting my own spin on it. So I began to play with the recipe. I had used butter and melted it instead of grapeseed oil, because that’s what I had on hand. Then I read that using melted butter in a cake recipe can give it a muffin texture and that it’s better to cream to the butter, as the pockets of fat are distributed and melt while baking – resulting in a fluffy crumb. Well, the cupcakes with the melted butter were soft but were also kind of dense. Point proven. So I creamed the butter. Better results. (Afterward, I liked the results even better with coconut oil.) Then I decided to separate the eggs – remembering when I did this in a recipe for coconut flour lemon cupcakes and it had a lovely moist, fluffy crumb. I don’t know what the exact science is, but in my experience I have noticed that when baking with coconut flour, it’s better to separate the eggs for a fluffier and moist texture than when using whole eggs. I creamed the butter with the honey and mixed in the egg yolks. That was mixed with the dry ingredients. Then in a separate bowl, I beat the egg whites to soft peaks and folded them in. So far so good. The resultant cupcakes were cakey, moist and fluffier. The final step was upping the cocoa powder to increase the flavour of the chocolate and a bit of vanilla to round it off. A special note about the artwork in this post: the drawings were lovingly made by my sister, who is a talented artist and to whom I am most grateful. To see more of her creative work, you may visit her blog here. 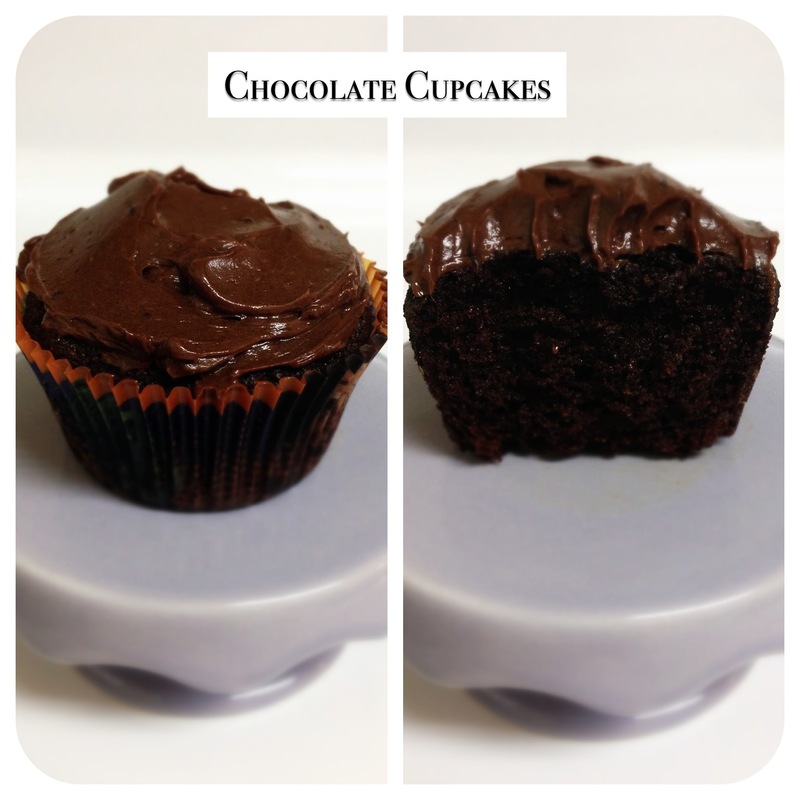 Since making these cupcakes with butter, I’ve also used coconut oil with similar results. When made with coconut oil, the batter is actually batter (when made with butter, it’s more like dough but they both bake up the same) and the cupcakes peel away more easily from the paper liners with little to no crumbs left behind. In fact, I now prefer to make them with coconut oil and use butter for the buttercream frosting. Preheat oven to 350ºF and line 9 muffin cups with cupcake liners. Blend together the coconut flour, cocoa powder, baking soda, and salt together in a small bowl. In a medium or large bowl, cream together the butter or coconut oil and honey until thick and creamy. Add egg yolks and mix until pale yellow in colour. In a separate, large metal bowl, beat the egg whites until they form soft peaks. Assemble the batter: Dump the dry ingredients into the wet ingredients and mix with a whisk or spatula until it’s mixed into a thick and luscious batter. Now begin to gently fold half of the beaten egg whites with a spatula to lighten, then add the remainder, and continue folding until there is no visible white remaining and the batter is smooth without any lumps. Fill prepared muffin cups half full or about 2 tablespoons per, and bake for 18 to 20 minutes. * Remove from oven and cool completely in muffin tin before frosting. *For mini cupcakes: use 1/2 tablespoon of batter per (I used a cookie scoop to measure it out) and bake for 15 minutes. Cool completely. I’ve been making this chocolate buttercream for years. It’s my go-to since it’s simple and quick to make, and can be made with little notice. The measurements provided are approximations, as usually I just eyeball the amounts. Make as needed. Mix butter, cocoa powder, and honey together with a fork in a small bowl until completely mixed and smooth. Spread generously on cupcakes. the cupcakes look awesome! and so does the artwork! I just made these cupcakes, and I wanted to mention that the frosting was very bitter with the ingredient proportions listed. I had to add quite a bit more honey to make it taste right. Like triple the honey. I’m so excited to take my first bite of these cupcakes though! They look awesome out of the oven! Hi Robyn, the amounts listed for the frosting are approximations only. It isn’t meant to be very sweet, but feel free to adjust to your preference. They turned out beautifully! What a terrific recipe! The cupcakes were moist and springy and had that perfect cupcake texture! When I ate the cupcake I understood more about not wanting the frosting to be too sweet. I think next time I will try a strawberry or raspberry frosting with them! Thanks again! Strawberry or raspberry frosting would be awesome with these! Thanks, glad you liked them!